Personalized child's natural rocker is designed for the littlest rockers. This personalized child's rocking chair is an heirloom quality keepsake that doubles as the sweetest seat in the house! Crafted of sturdy, solid hardwood; natural finish. Holds up to 70 lbs. Specify name; limit 1 line, 12 letters/spaces. Specify personalization color; blue, pink, red or black (blue is shown to left). 22 1/2" high overall; seat is 14 1/2" wide x 11 1/2" deep and 10" from floor. Easy assembly; instructions and hardware included. The only suggestion I would make is to glue all the connections that are screwed together. The chair looks to be solid enough but kids abuse things so an added protection beyond the screw can't hurt. The rocker is beautiful and worth every cent of its cost. A couple of the holes had to be drilled a little deeper in order for the screws to seat proerly (the holes in the rockers were a problem to prevent floor scratching). I hesitated to buy due to it being made in China! I did reccommend to my sister who bought it for her grandchild. My young son has this rocking chair at home and absolutely loves it! He sits on it, climbs on it, is rough with it, and the chair is as sturdy as a rock! The quality of this chair is heirloom quality and I know he will be able to pass it on to his children one day. We couldn't be more satisfied! My Granddaughter loves to crawl into it and then sit down or backs up into it. A great gift. My husband put this together, it wasn't too hard. He used a better grade of wood glue. The rocker is nice, and fairly sturdy, but some of the holes for the screws and cross arms were too big, and we had to use glue and hope that it would hold. shipment. I have my wicker childs rocker and wanted to get it to him but the postage was prohibative. This was the a great opportunity. 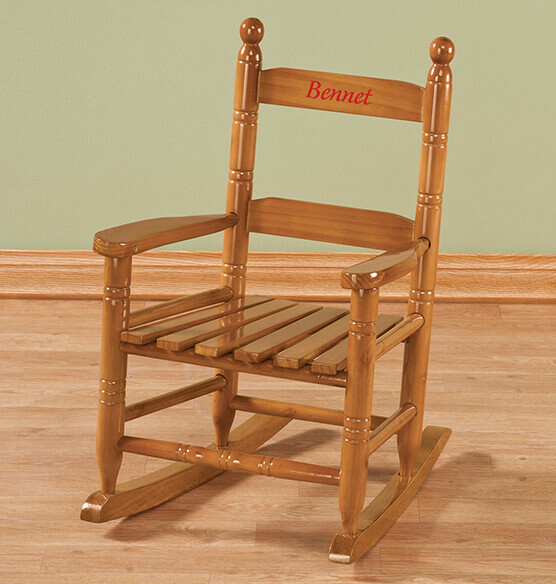 I have bought a number of these rockers for my grandchildren and great grandchildren for their first birthday. I was stunned when the price went up $20.00. This was a HUGE INCREASE and I don't think I will buy again. Bought for 15 month old and the seat is at such an incline it is hard for him to get on. I thought the seat would be level. I order a lot of personalized products from this company because of the price and the quality of the personalization always painted or stitched. When I received the rocker the name was a sticker which I could buy a rocker and personalize it myself. What a pain in the neck it was to assemble this. Thank goodness for epoxy. There were two places where it was just impossible to follow the instructions (which are printed in teeny weeny type on a very faded page) so I wound up gluing the chair together. I use it to display part of my teddy bear collection, but I would *not* feel good about letting an actual child sit on it -- not confident that it's sturdy or safe enough for a child to use. It's cute and it does the job I wanted it for but gosh ... what an ordeal getting it set up. This is a really cute gift for a child...BUT! The instructions lack detail, not for the person with ten thumbs. They "suggest" using glue; glue ALL joints if you want it to last. Also, I would recommend sanding the finish down to the bare wood before applying glue. Some parts were marred--and lacquered over. There are exposed screws in the seat bottom and the screws were designed to go into an un-drilled dowel rod. Not sure they will hold over time. A little frustrating to assemble as when you put one part on, another came out of its hole. Again very disappointed in finish and rough patches. Name was off-center -started in center. If I would have had time, I would have returned. I purchased because it looked very similar to the chair I have from my childhood. extremely difficult for the recipients to return them. Is the personalization on a stick label? BEST ANSWER: Thank you for your question. The personalization is painted on. We hope this information will be of help to you.